This lesson provides an overview of Earth’s atmosphere, its vertical structure, the fundamental forces acting on air, and how the atmosphere's composition affects the colors we see in the sky. The lesson also includes information about how Earth receives energy from the Sun as solar and infrared radiation, and the mechanisms for transferring heat around the globe. Learners will be introduced to the components of Earth’s water cycle, and also briefly explore the main types of systems used to observe the atmosphere. Excellent lesson. Well organized and informative. This is a great course, to refresh your your mind, and to learn the basic of atmosphere. Some of the questions in the lesson were worded poorly. Despite knowing the information prior to the course and using it as a refresher, some of my answers were incorrect because of how the question was worded. Informative, with easy-to-absorb formats and useful testing. its ridiculous that i need to do this survey to have my homework accredited. It would be beneficial if all lessons were available as a .pdf for easy future reference without the need to use the internet. Rich in content, concentrated knowledge. Meanwhile very accessible and easy-to-read. This was a great refreshing course for me. I had the greatest opportunity to re-learn most of these things. 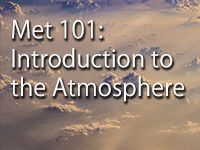 This "Introduction to the Atmosphere" course has really helped me to refresh and it keeps me updated with the latest information about the atmosphere and ways the world is engaging in to observe it. I believe this course will always be reviewed and updated and thus it is recommended as a refresher for professionals and enthusiasts as well as new learners. Thorough explanation of atmospheric basics and the primary forces influencing weather. Great lesson looking forward to taking many more thanks for such a great course in learning about weather and how the atmosphere works. Relatively easy if done after reading from the text. This helps me a lot to recall all the basic information about the atmosphere. Excellent starter and refresher course. This lesson provide core concept of atmosphere which benefit to not even meteorologist but also civilian for further understanding in basic of weather forecast pricipal. Great lesson but the links need to be updated from www.srh.noaa.gov to www.weather.gov. From this lesson I know variation of pressure according to the altitude and the cause of those changes. I know the hydrologic cycle and to differentiate his processes. i gained knowledge also about sunlight and visible spectrum. so think you for your short course because all those are useful in my daily work as meteorologist. This has help me a lot in my work and the understanding of our atmosphere. Would be nice to see which specific answers were wrong so I could fix it. It is good for everyone to know about the weather and its elements. This is a great start in understanding the Atmosphere, with simple explanation and supported by visual demonstration. I appreciated the basic information which is often skipped as assumed knowledge in presentations by Skywarn. Excellent for a rank beginner to the subject who is interested in learning more about severe storms or weather in general. Even Ididn't ace the pre-test! I'm glad I have the chance to review most of what I've learned in the past. It is indeed a resourceful tool to improve my forecasting skills. Very informative and well arranged! Thank you for helping me understanding meteorology better. Content, teaching method and technology are greatly combined. i will recommend my friends to try it. this was an interesting experience, but they should tell you where you went wrng in the pre test so you can improve on the quiz. This was very different for me. It would be useful to inform exactly in which question you failed the quiz, because each question has several options. Great course to learn the fundamentals!! I love the lessons, format and quizes. I would like to see the answers that I got wrong, however. There is an "X" showing which number is incorrect, but does not show the correct answer. I understood the content of the material from college courses. I would recommend this to anyone interested in learning about our weather. Replace some of the blocks of text with a short video lecture talking about the concepts. The lesson concentrated on very key elements, which are necessary for more detailed study and understanding. Very well done. Love the interactive portions. Very Basic, but it is great information for starters. I needed to brush up on my foundations and this was a great start. Thanks! This topic mostly under my field especially at work. Also gives addition to my experience. I find this lesson a very useful and important task to everyone who will be interesting in studying the atmosphere. Such a great lesson! A lot of this is about the simple weather that you learn in cool when it comes to evaporation, rain, ect... However there is quite a few things on here that I was very surprised by such as the life of a single water molecule. Has made me want to research a few things that I would like answered that isn't a part of this subject. It was quite interesting and educative,would recommend others to try it. Preparing for Skywarn training I find this material very informative in understanding how everything works. Good overview and very understandable. This lesson is very important with Beginners in the field of Weather Monitorin. Understanding the atmosphere, and tracking the atmospher will ensure good weather forecasting. This programme is highly educative. I have actually learnt a lot from it. Thanks to the the management. It's worth the time. It helps to understand the environment better. Thank to MetEd for this opportunity. Generally good,but didnt really learn anything as there is no information given to read to answer questions properly! Short, concise and easily understandable for someone just beginning their understanding/education of weather. Made me apply many principles of physics that I know from university physics to the atmosphere. Those rain drops, snow flakes and clouds will look a little different to me now. An excellently designed course that provides nice animations to enhance the topic. A wonderful introduction and refresher for the basics of the atmosphere. I am a High School teacher and this lesson would be great for an introduction to Meteorology course. Great introduction to the basic cycles of atmosphere and weather. Very good course for refresher/recurrent training. Great introductory course. A quiz that does not show which questions were missed and what the correct answer should have been does not lead to learning. Excellent review of my past experience and studies. I think that clear concise information will make this lesson clear and easier to read. Short and simple, common knowledge that everyone should know, it is practical. The lessons are concise and well illustrated with good explanations. The user interacts with the lessons along the way to completion so as to not be taken by surprise at what is on the final test. Really informative in enhancing one's knowledge of metereology. I really appreciated this lesson even though I have taken (and am taking) numerous physical geography classes in college. The material is very well presented (unlike most textbooks) and enables the student to explain the principles covered with interesting and logical flow. Perfect starting point for anyone interested in Meteorology or any related field. Studied in school years ago. This was a nice refresher and well presented. The midstream Q/A was helpful and the material is well presented. Thank you! Overall pretty good. This may work better as a supplement to a meteorology or related course than stand alone given that it's a lot to take in over the course of only ~90 minutes or so. I also found a couple of the embedded questions to be worded in a slightly ambiguous way (most notably the question about how much sunlight the poles get vs. the equator, alongside the one about which receives more heating. I'm guessing the first questions referred to hours of daylight vs. actual amount of sunlight and I read it wrong). I would recommend this both to intro students, students in a general earth science course and motivated individuals who are just interested in the basics of meteorology. I wasn't sure that the creators of this lesson had really identified who they were aiming it at. Some concepts were expected to be known (for example, what refraction, diffraction, reflection etc are) others (eg what air pressure is) were not. Some of the questions in the initial quiz were ambiguous - e.g. did they mean relative amounts, or absolute amounts? Excellent presentation of basic information. The graphics were useful in explaining some concepts. As a youngster I used to receive weather maps from the Weather Bureau (before NOAA) and record local weather conditions. I knew my clouds and what they likely indicated. Lots has happened since then! I am happy to understand the dynamics of precipitation better now, and have a much better understanding of global weather patterns. Thanks you! I am a ham radio operator and sky warn weather spotter. This study will help in understanding atmospheric principles. A basic lesson about atmosphere dynamics. I have always been interested in weather. Not knowing anything about the subject I decided to take this course. I enjoyed it a lot and plan to others. The lesson was clearly and well delivered. Also, the contents of the lesson is very appropriate and straightforward for someone without prior knowledge of the atmosphere to easily understand. This is a good place to get started. I think that MetEd should line many modules and courses into a SUPERCOURSE that covers Meteorological and Oceanographical Information and would be the equivalent of a "Introduction to Weather", Freshman level, College course. 85% on pretest, 100% on post test. Enjoyed the lesson. Using for ham radio/NWS Skywarn project. This should be required study for all Americans. It is relevant to everyone. Any student of science, regardless of specificity, can benefit from this material. The lesson really begins at the beginning and should serve as a firm foundation for future lessons to build upon. Very informative, entertaining and captivating for anyone experiencing weather, and who, alive, isn't? Excellent and useful content.A perfect key to knowledge. I'm university student and this course is more didactic and understandable. Very well done, easy to understand and presented in a concise but interesting manner. Great lesson for a new student or as a refresher course.